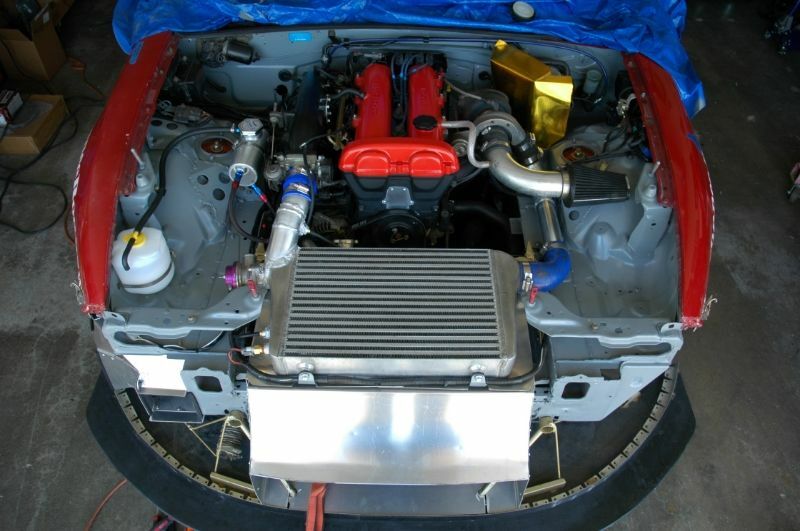 Miata LFX Swap (Singular Motorsports & Good-Win Racing) - Page 5 - Miata Turbo Forum - Boost cars, acquire cats. for the idiots (me) who can't/won't wrench. any idea on turn-key costs? or better to wait till you're 100% done. Last edited by Chooofoojoo; 07-16-2015 at 06:30 PM. Abacus Kitty is keeping an eye on the bottom line for us. Turn-key includes labor, so we won't know till' it's done. You could probably ring V8R and get an estimate though. I've been sucked into this escapade as well. 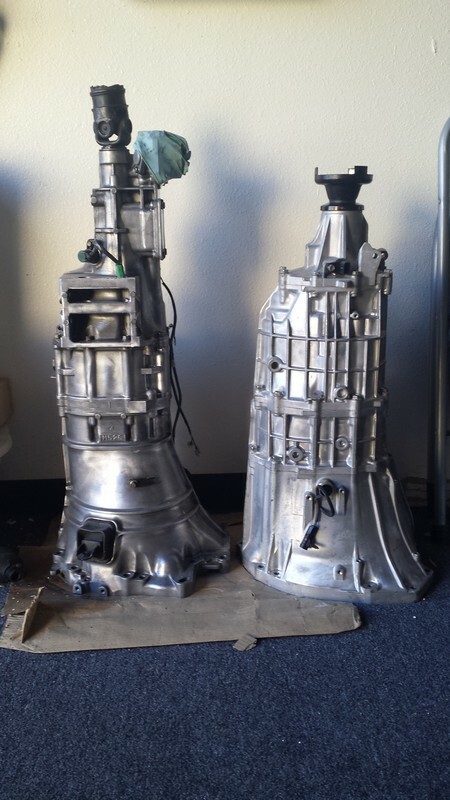 Check out the MV7 transmission next to a 5 speed Miata. While they look about the same, the MV7 feels like it weighs 35lbs more (have not scaled them yet). If I recall correctly, with the MV7 gear ratio mated to a Getrag 3.23, gear-limited top speed at 7200 rpm's is 210mph. Yeahhh that is why I went with the 3.42, and will still be on the look-out for a 3.72. You were right when we spoke a couple weeks back though - the motor has the torque, so the longer gearing might make for a no-drama 3rd gear-only lap on tight tracks.. looking forward to experimenting. My MV7 has been living the life of luxury on a pallet up till now. I'll put it on the shipping scale tomorrow. It has certainty gotten it's tan on thanks to CJ putting it outside every day. Yeahhh that is why I went with the 3.42, and will still be on the look-out for a 3.72... so the longer gearing might make for a no-drama 3rd gear-only lap on tight tracks.. looking forward to experimenting. Top speed is still 168mph with a 3.9, and 80mph cruise is only 3400rpm. I'm really liking the looks of this swap with a stock mazda 3.9 diff and the 949 big-pawr-spec Giken that I already have sitting in the garage. According to the 3 different builds I've seen, I think I could do the whole swap for somewhere between $6k and $7k after deleting the Getrag diff stuff from the list and then selling my 99 engine, 6 speed, miataroadster shifter, lightweight clutch, and megasquirt. That's pretty damn tempting. The swap is doable while keeping the factory rear-end stuff?? I have a Giken too and a 3.9, soooo tell me more. It is do-able, sure (isn't everything). The PPF is normally removed for the swap, which the factory Miata differential relies on. To retain the diff you would need to address a new mounting solution, and get a custom driveshaft made. This thread is making me regret my turbo motor. 300whp that you can drive to the store or the track without years of mechanical drama and breakage? Fuuuuuuck. without years of mechanical drama and breakage? <br />That just wouldn't be fun though. Yeah, we'd never learn anything about working on our cars that way. Might as well buy a Porsche if you don't want to know how a car works. I was going to put my current motor/turbo/cooling system up for sale in the next week or so, but a local customer jumped all over it. I'm rather satisfied that it's staying local. Took me 4+ years, many many hours, and many revisions to get the turbo to run dead reliable at the track. Last edited by ThePass; 07-17-2015 at 06:37 PM. Last edited by AlwaysBroken; 07-17-2015 at 03:33 PM. Or completely off topic talking about 'his' car experience thus far. So it looks like there are lots of options for the Miata. One of the surprises wtih the Catfish is that with some good horsepower pushing 1,700lbs, shorter gearing is the last thing you want. It always seems like first and second get you through the intersection only, so these new gear ratios should really help the car stretch its legs. I'm REALLY excited to see how this build progresses. Last edited by cordycord; 07-18-2015 at 12:11 AM. This is the one area that is still a bit of a ?? for me. Has the LFX built-up a good track pedigree yet? I think most of the Camaros seeing the track have LS motors. Miata guys might be the first ones to really wring it out. OTOH, so understressed in a Miata application -- so . . . .
<br />And Rick, I have been thinking that as well. OEM does not necessarily mean track ready. Maybe we will find that it eats cams or valves or timing chains with sustained >5k RPM operation.